Nuclear winter: global consequences of multple nuclear explosions Turco RP, Toon OB, Ackerman TP, Pollack JB, Sagan C. - Science. 1983 Dec 23;222(4630):1283-92. 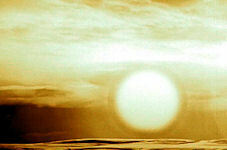 The Tsar Bomba (“King of Bombs”) hydrogen bomb, tested at 50 megatons but designed to yield 100 megatons, is the largest-ever nuclear device to have been detonated. In October, 1961, the General Secretary of the CPSU, N.S. 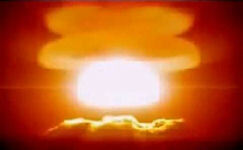 Khrushchev, made an announcement at the 22nd Congress of the CPSU regarding the planned, 30 October 1961 test of the most powerful hydrogen bomb in the world (the number 100 megatons was stated). Indeed, such a test was conducted at Novaya Zemlya, but with an actual yield of 58 Mt (by some accounts, at the last moment, it was decided to conduct the test with a less-than full yield). When the nation's population was informed of the test, the actual charge yield was not noted. 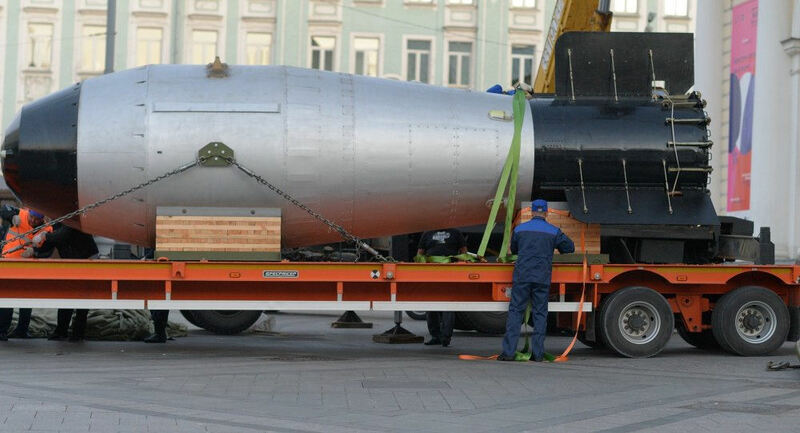 The device was variously named AN602, also "Tsar Bomb", "Kuzka's mother", "Kuz'kina Mat", Vanya, Big Ivan and also (erroneously) RDS-202 and RN202). 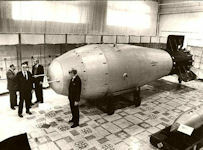 The AN602 thermonuclear bomb was, developed in the USSR in 1954-1961 gg. group of nuclear physicists headed by Academician of the Academy of Sciences of the USSR Igor Kurchatov. The development team included B.Sakharov, B.Adamski, N Babaev, N.Smirnov, Yu Trutnev and others. 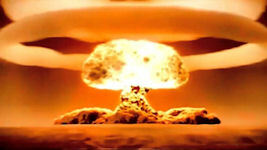 The total energy of the explosion, according to various estimates, ranged from 57 to 58.6 megatons of TNT, or about 2.4 × 1017 J, which corresponds to a defect of mass 2.65 kg. 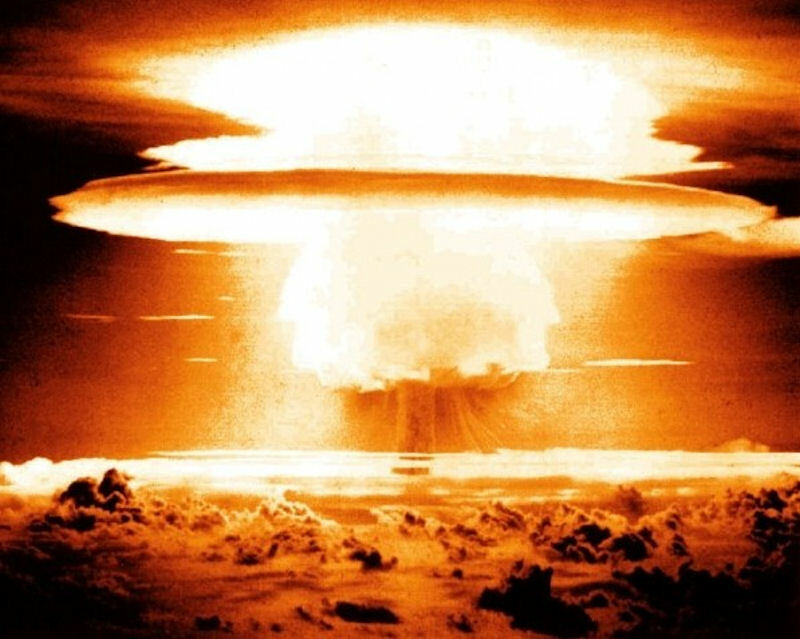 Nuclear weapons and the fear of annihilation framed Cold War diplomatic relations between the Soviet Union and the United States. As Soviet premier Nikita Khrushchev prepared to test a 50-megaton bomb, Americans pressured the United Nations to propose banning the detonation, fearing the impact such an explosion would have on the world. 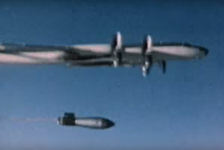 Soviet premier Nikita Khrushchev threatened, “The 50-and 100-megaton bombs will always hang over their heads like the sword of Damocles”. The Soviet Union’s detonation (October 30, 1961) of its 50-megaton Tsar Bomba (the “King of Bombs”), was the most powerful nuclear weapon ever designed (about 10 times the combined power of all the conventional explosives used in World War II). 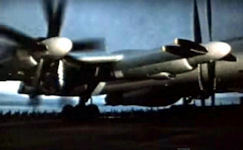 In a confident, saber rattling mood, on 09 December 1961, Khrushchev told the World Federation of Trade Unions [WFTU] congress that the USSR had bombs stronger than 100 megatons, which will hang over the heads of the imperialists like the sword oe damocles and that "we would be slobbering idiots" not to have resumed nuclear testing. in alluding to an international corridor to West Berlin, Khrushchev: commented: “strange people - they still think of the Soviet Union as it used to be. They don't realize we have changed our shorts for long pants." It had a designed yield of 100 megatons but was tested at half that yield, in part so that the plane that dropped it would have time to fly to safety. Due to its size and yield the Tsar made a huge, international political and military splash, but in reality it was impractical for military use. No more were built. 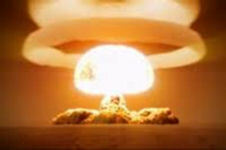 The power of the explosion exceeded the combined power of all explosives used by all countries during WWII. The explosive energy released exceeded 3,800 times the Fat Man bomb dropped on Nagasaki. On October 30, 1961, a specially modified Tu-95 strategic bomber enveloped in a protective white coating, dropped the massive bomb at a testing range on the Novaya Zemlya Archipelago in the Arctic Ocean. The 26-ton explosive device was parachuted from 10,500 meters so that the bomber and a flying laboratory that was collecting data had time – 188 seconds – to leave the area. 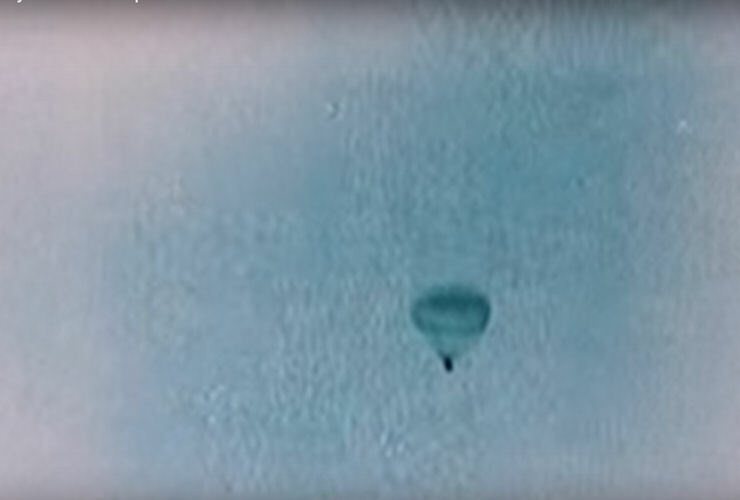 The bomb detonated at an altitude of 4,200 meters. 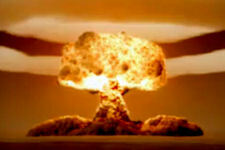 The unprecedented explosion was expected to measure 51.5 megatons. 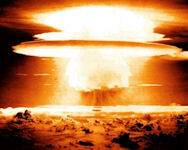 In reality, its power was estimated at between 57 and 58.6 megatons. 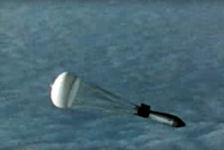 The fireball reached a radius of about 4.6 kilometers and was visible from a distance of 1,000km, despite dense clouds. Theoretically, it could reach to the surface, but this was prevented by the reflected shock wave, which deflected the bottom of the fireball and displaced the fireball off the ground. The light could potentially cause third-degree burns at a distance of 100 kilometers. 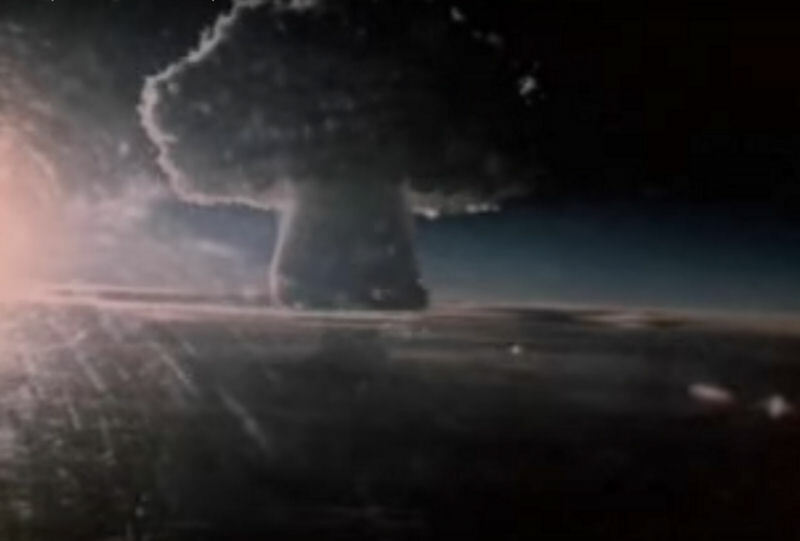 The nuclear mushroom cloud rose to a height of 67 kilometers, and the diameter of the mushroom "cap" reached (in the upper tier) a diameter of 95 kilometers. The sensible seismic wave that resulted from the explosion, circled the globe three times. 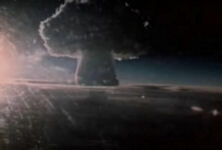 Witnesses felt shock and were able to describe the explosion at a distance of thousands of kilometers from its center. 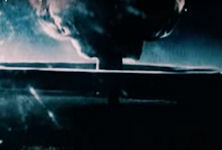 The sound wave generated by the explosion, reaching as far as Dikson island at a distance of about 800 kilometers, the wave blasted out windows, bringing the sound of cannonade with it. However, any destroyed or damaged buildings were located much closer (280 km) to the test range settlement Amderma and settlement Belushya Guba. The ionization of the atmosphere caused radio interference, even hundreds of kilometers away from the test range for about 40 minutes, Radioactive pollution experienced field radius of 2-3 km in the area of the epicenter was less than 1 mR / hr, testers appeared on the site epicenter in 2 hours after the explosion. Contamination virtually posed no danger to the test participants. The US analysis showed that this device used a lead jacket around the fusion materials, and gave only a few megatons fission. Thus the Russians reduced the fallout, especially that which might have fallen on their own country. If lead were replaced by uranium, the Russian device would give 100 megatons or slightly more. Fusion bombs actually work by both fission and fusion. In a typical two-stage weapon, the fissile materials detonate first to compress and heat the fusion fuels, such as hydrogen isotopes tritium and deuterium, to tens of millions of degrees. Just as in the sun, the chain reaction in the second stage fuses the hydrogen atoms into heavier helium atoms and releases vast amounts of energy in the process. A third stage can be added in which a uranium jacket containing the two state device is detonated, in which case possibly half the yield of the bomb would come from fission, not fusion. 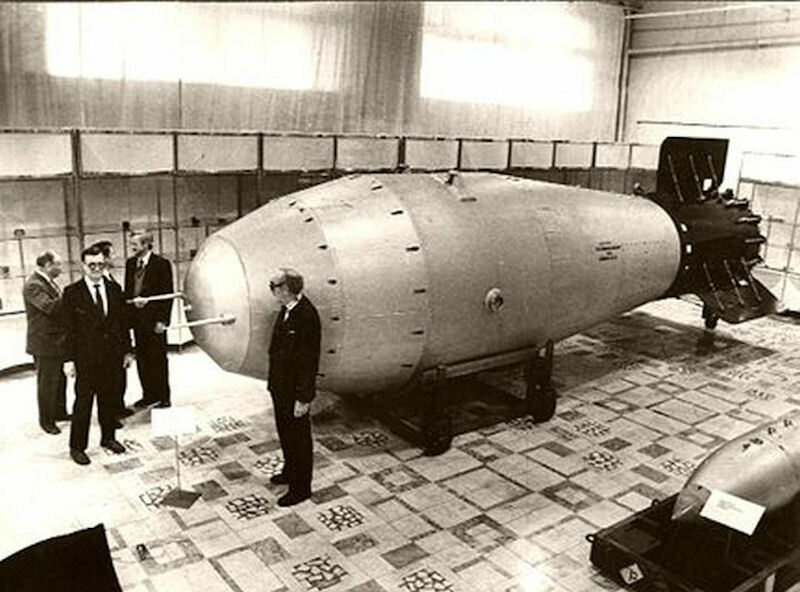 It is believed that the Tsar Bomb was intended to be such a three stage device, but for the test a lead jacket was substituted for uranium. The Tsar Bomb made a huge international political and military splash, but in reality it was impractical for military use. No more were built. 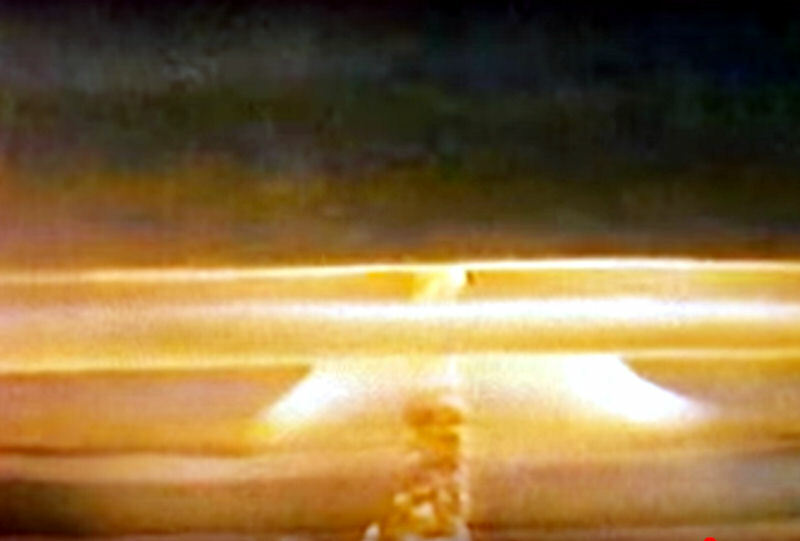 In the United States, the Department of Defense (DoD) typically tasked national labs to design and build nuclear weapons that produced the specific yield required to destroy one or several types of specific targets. Too little yield and the weapon would fail to destroy the target; too much and the blast would cause unanticipated, unintended, and/or undesirable consequences. The weapon should, for example, have a yield whose subsequent effects would destroy the enemy’s missile base but not harm the nearby town. From the U.S. perspective, the goal was to eliminate an adversary’s ability to fight, not wipe them out. So the yield of U.S. nuclear weapons needed to be like Baby Bear’s porridge: not too cold and not too hot, but just right. 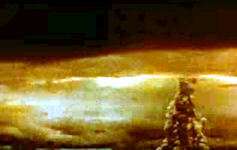 The destruction caused by a nuclear weapon is also determined by the conditions under which it is detonated: on the ground, at different heights above the ground, underground, on the water, at different depths underwater, in the desert, in the Arctic, in the mountains, in a city, above a city, up in space, etc. The same-yield weapon — capable of releasing the same amount of energy — detonated in each of these environments will result in very different kinds and degrees of destruction. 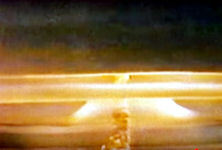 Sometimes a lower-yield weapon causes greater destruction than one with higher yield detonated in different circumstances. A Draft Memorandum From Director of Central Intelligence McCone to Secretary of Defense McNamara, July 2, 1963, SUBJECT: 'Comments on Conclusions of the White Papers (Draft) on Nuclear Testing Problems", stated "Our estimates lead to the conclusions that the Soviets now possess missile delivery warheads of about 25 megatons and are in the process of developing a missile which can deliver a 100-megaton warhead. 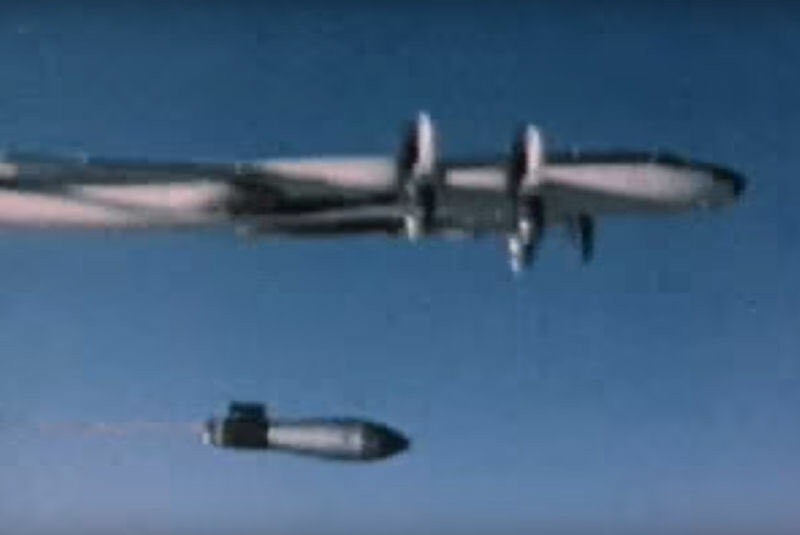 It is apparent that these large warheads can destroy vast areas from thermo effect if the large megaton warheads are exploded at high altitude. 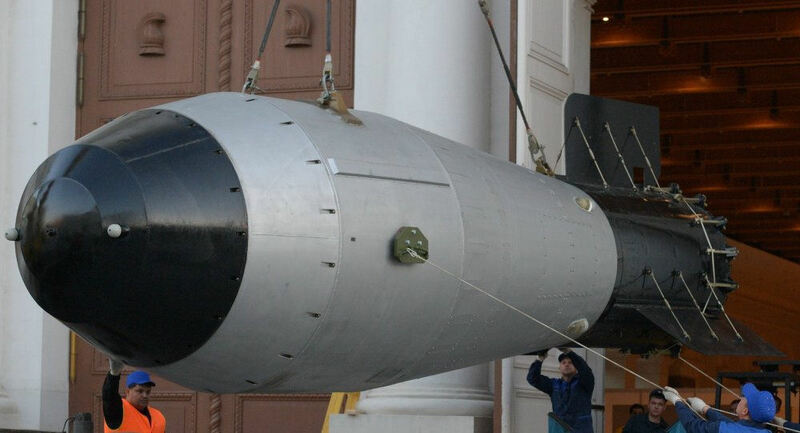 It does not appear that weapons of this type would be useful against our hardened missile sites and it does not appear to me that the Soviets will plan such uses, as they will have several hundred ICBMs capable of delivering warheads of about 10 megatons. These, I believe, would be used against our missile sites." 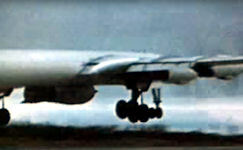 The United States, without further testing, could have developed a warhead of 50-60 Mt for B-52 delivery. Some improvement in high yield weapons design could be achieved and new warheads -- for example a 35 Mt warhead for the Titan II -- based on these improvements could be stockpiled with confidence. 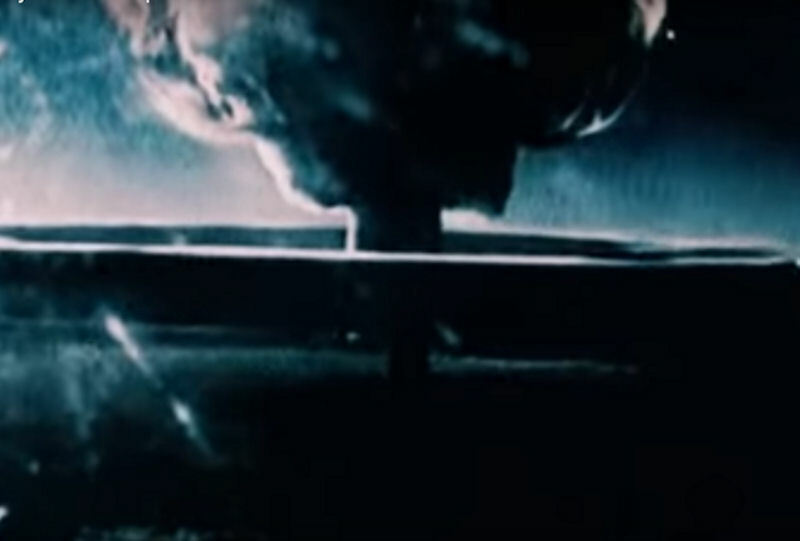 In 1983 Carl Sagan, among others, warned of the danger of nuclear winter. They reported that "Significant hemispherical attenuation of the solar radiation flux and subfreezing land temperatures may be caused by fine dust raised in high-yield nuclear surface bursts and by smoke from city and forest fires ignited by airbursts of all yields.... The yield threshold for major optical and climatic consequences may be very low: only about 100 megatons detonated over major urban centers can create average hemispheric smoke optical depths greater than 2 for weeks and, even in summer, subfreezing land temperatures for months. " 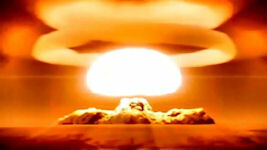 These dramatic and controversial predictions received world-wide media attention.